With space utilization such a hot topic at CPS right now, of course it makes sense that some of you would be curious about how I arrived at my conclusion that the CPS Space Utilization formula from 2011-2012 was incorrect and misleading as to the number of under-utilized elementary schools in the Apples to Apples Elementary Data set. Question: Where did you get the numbers for each school in 2011-2012? 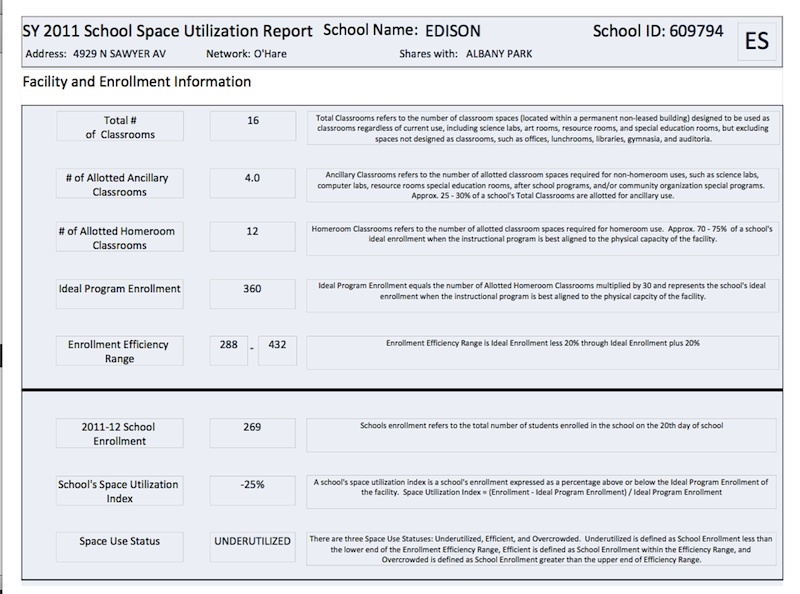 Each elementary school page on the CPS website has that school’s Space Utilization Report for 2011-2012 listed as a downloadable PDF. 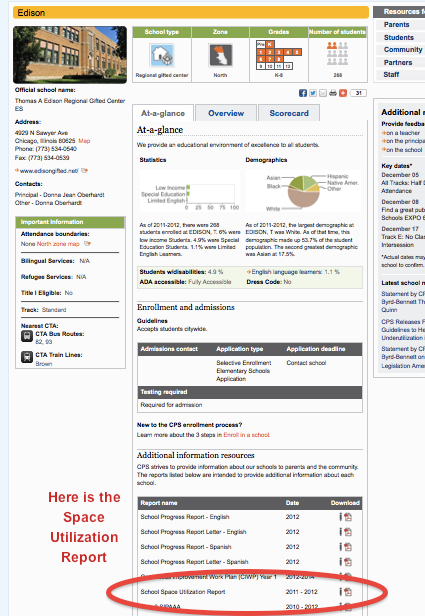 The “ideal enrollment” for this school in 2011-2012. The lowest enrollment and the highest enrollment that the school could have and still be considered “efficient” by CPS in 2011-2012. The percentage of under or over-enrollment based on the ideal enrollment in 2011-2012. The label that CPS applied to the school in 2011-2012: Under-Utilized, Efficient, or Overcrowded. Bottom line? I got the numbers from CPS. They are not the most current numbers because those numbers have not been released as of December 4, 2012 at 12:38 p.m. Question: Where did these numbers—classroom vs. ancillary—come from? I’m not sure who was responsible for gathering or giving the information on each school to CPS. I also used recent school floor plans from the Asbestos Inspection Reports that CPS also posts for each school. If you open up the PDF “Asbestos Inspection Report 2010” and scroll through it, all of them that I have reviewed have a floor plan of the school with classrooms identified. (Here is an example from Beaubien Elementary and it begins on Page 28) These reports are no longer publicly accessible via CPS.edu as of January 2018. This is significant because the fewer homerooms you have, the fewer students you are required to have enrolled in the school and still be considered “efficient” by CPS. So under-reporting potential homerooms can make an underutilized school appear more efficient according to CPS’ formula. To give CPS the FULL benefit of the doubt, I corrected for under-reporting of homerooms in my “adjusted formula”. This increased the potential number of schools that were considered as under-utilized under the old formula. Question: What WAS the formula that CPS uses to calculate IDEAL enrollment in 2011-12? Question: Where did this 30 students number come from? I thought CPS Guidelines on Class Limits were 28 students in K-3rd grades and 31 students in 4th-8th grades? Question: So, what is the problem with this formula? This is a bit more complicated, so bear with me here. If we take an average of 30 students per homeroom as the MAXIMUM limit of students in a homeroom, then any enrollment OVER an average of 30 students per classroom should be considered overcrowding. But that is not what the 2011-2012 CPS formula is showing. 30 students per homeroom – 20% was the “bottom” of the efficiency range. After the top of the range was reached? CPS considered a school officially overcrowded. After enrollment went under the bottom of the range? CPS considered the school officially underutilized. The problem with this formula was that it set a NEW maximum for the average number of students in the classroom BEFORE CPS considered that classroom (and school) to be overcrowded. So CPS did not officially consider a school overcrowded in 2011-2012 until it had an average of 36 students in each homeroom.